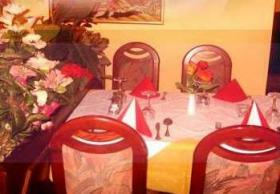 This cozy little restaurant, situated in the very heart of Cologne, offers delicious Indian cuisine for moderate cost. This cozy little restaurant, situated in the very heart of Cologne, offers delicious Indian cuisine for moderate cost. The walls are dyed in a friendly yellow color and show a multitude of decorations hailing from the land of the Ganges. Especially the paintings of contemporary Indian art create a joyful mood by the colorful style they are painted in. A lot of tastefully arranged greenery ease the mind and make for a lively atmosphere. In the summer time a sunny terrace calls to the “Bombay”. Bombay’s menu offers Indian delights for easy sampling of exotic artful cuisine. Tandoori dishes convince with freshness and the love that went into preparing them as well as the many different chicken and lamb variations. Indian cuisine is spicy and hot but on special request all the dishes may be served mildly seasoned. In addition not only Indian dishes are served. A choice of international favorites is available on the menu as well. Typical for the Indian cuisine the team of Bombay’s Kitchen offers a plethora of vegetarian alternatives in their repertoire. A table reservation or the booking of a menu/ offer is in the "Bombay Restaurant" via GlobalGuest always for free you as a guest!